It is often noted during times of equity market volatility that investing in fixed income within a diversified investment portfolio is money well invested. This is because fixed income is usually negatively correlated to more volatile asset classes such as equities. However, this has been known to break down on occasions. None more so than during times of market stress or abnormal market conditions, when the benefit of negative correlation to a volatile equity market is most required. A good example of this was during the GFC, when bond, credit and equity markets were all positively correlated during the market crash. It begs the question of why an exposure to fixed income is even necessary? Unequivocally, fixed income should always be a key component of a balanced investment portfolio. It is as important as having risk (equity, credit and alternative assets) embedded in the portfolio, as well as a component of liquidity (cash). The key reason for having exposure to fixed income is less to do with correlation, and more to do with a higher degree of predictability over cash flow (and capital return). This measurable “predictability” still provides a necessary 'volatility-dampening-effect in times of correlated volatility. The term “carry” is frequently used when fixed income investment managers discuss different components of performance attribution. In the fixed income world, carry is another term for the coupon cash flow that an investor receives from their fixed income investments. The issuer of a fixed income security has a contractual obligation to pay coupons (i.e. make interest payments) on the money borrowed from investors over the life of the bond. This certainty of cashflow is reflected daily in the bond’s “dirty” price through an accrued interest calculation (N.B. the “clean” price of a bond excludes the accrued interest). Therefore, this legal obligation by the issuer of the security permits the market to trade on the basis of certainty. While the capital price of a bond can rally or sell off based on the market’s perception of the issuer’s capability to honour its debt obligations, a fixed income price has a positive bias through the accounting of accrued interest. Any downside pressure on an investor’s portfolio is dampened via this predictable positive cashflow associated with a fixed income security or portfolio. The volatility dampening benefits to an investment portfolio can be seen in the chart below. The chart compares the total return performance of Commonwealth Bank of Australia (CBA) shares (including dividends), against a CBA senior bond paying a 3.895% semi-annual coupon. To simulate a very simple multi-asset class investment portfolio, we combine the performance of both the equity and the senior bond in a 50:50 portfolio, as shown by the grey line. 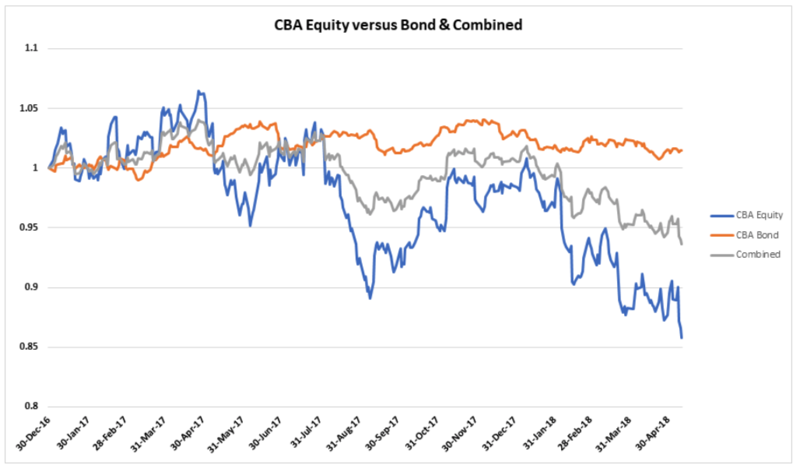 As a direct result of the CBA senior bond’s carry (together with a finite date for CBA to repay its debt obligation), the bond’s standard deviation is 4 times lower than that of CBA equity. This is reflected in the relatively stable orange line. When including the senior bond in the 50:50 portfolio, the volatility dampening effect on CBA shares results in the standard deviation being halved. Regardless of the equity-bond negative correlation relationship being intact or breaking down, fixed income still has an important volatility-dampening role to play in a balanced investment portfolio, primarily because of the positive effects of carry. This article is prepared by Mason Stevens Limited (Mason Stevens) ABN 91 141 447 207 AFSL 351578 and is general advice only and does not take into consideration yours or your client’s personal objectives, financial circumstances or needs and should not be relied upon as personal advice. You should consider this information, along with all of your other investments and strategies when assessing the appropriateness of the information to your individual circumstances. Securities, by nature, rise and fall and as a result investing in securities including derivatives involve risk. Past performance is not a reliable indicator of future performance and may not be achieved in the future. Mason Stevens and its associates and their respective directors and other staff each declare that they may hold interests in securities and/or earn fees or other benefits from transactions arising as a result of information contained in this article. Mason Stevens ensures that the information provided is accurate and complete but does not warrant its accuracy or reliability. Opinions and or information may change without notice and Mason Stevens is not obliged to update you if the information changes. Mason Stevens and its associated companies, authorised representatives, agents and employees exclude to the full extent by law, liability of whatever kind, including negligence, contract, fiduciary duties or otherwise, to investors or anyone else in respect of any loss or damage, including indirect or consequential loss or damage, foreseeable or not, arising from or in connection with this information.